Zak, tell us, what job do you do and where do you do it? I’m the distiller at Strathearn Distillery, based near Perth. How long have you been doing that particular job? It will be two years in March. On a day-to-day basis, I’m in charge of production mainly from the gin we produce through to the Scotch whisky spirit, the cask choice, and then when it comes to that time, selecting which casks are to be released as well. Plus, there is an awful lot of ‘R&D’ here too, looking at new products which we do as a team of three. Describe your journey into the Scotch whisky industry. owner and founder’s passion definitely rubbed off on me and from there we just went forward. You call yourself ‘probably Scotland’s smallest distillery’. Why is that? We have two alembic stills, which are really unusual in Scotch whisky production. The wash still is just 1,000 litres and the spirit still 500 litres, so in whisky terms they are tiny stills. We use the term ‘probably’ because there are so many craft distilleries popping up and to keep tabs on them all is quite difficult. We are actually Scotland’s smallest distillery, but in the future? Well, time will tell. The stills that you have are really quite unique. Tell us more about them and how they work. Our stills are copper alembic stills. The reason we went for them is that we found them to be more traditional; they have this Middle Eastern look to them, and that is where distillation would have come from. We believe this is the shape of stills the crofters would have used up in the moors in the time of illicit distillation. What style of spirit do these unusual stills produce? At the moment we are using a brewers’ barley which gives us a lot of biscuity and malty flavours coming through. Our spirit is therefore very sweet. We have also done triple distilled spirit before, to add that sort of Lowland style to our inventory. And we have also produced peated whisky spirit and blended different barley styles together, which has given us a more nutty spirit. We have a really unique mix of maturation casks, too. The main ones which we are laying down, that in five or six years time will become the Srathearn standard bottling, will be virgin French oak. In the background of that we have three different sherry styles of cask maturing. We also use new American oak, ex-Bourbon barrels and we also have a couple of wine barrels, ex-rum barrels and ex-port barrels. So we really try and do a mix. 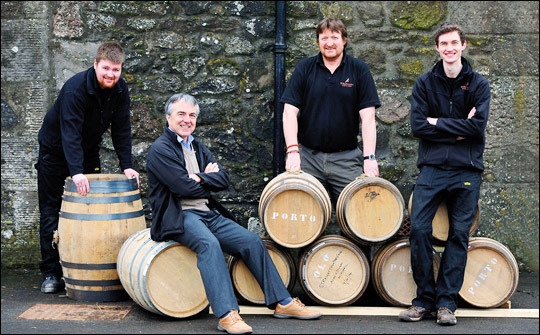 If you could work at any distillery in Scotland for a day, where would you go and work? Of course I love it here; we have so much innovative stuff going on, but I’d have to say that I’d like to go and see Ballindalloch Distillery for a day. I’d love to see a new distillery on the medium size, between the big guys and us. If you could go anywhere in the world to see a different spirit being made, where would you like to go? Well, Liam our brewer is a big rum drinker so we’ve been getting into that more and more, so I think I’d have to say rum. And if someone else is paying for the plane ticket, I might as well go somewhere hot! Finally, how do you like to drink your whisky? Are you a neat, on the rocks or in a cocktail person? That all depends on the whisky I’m drinking. I’m very much of the opinion that whisky should be drunk the way that you like it. If that’s with water, or with ice, that’s fine. For me personally, I would try it neat and then make a decision after that on how I’d like to keep drinking it.